"The 'Careers' module allowed me to reflect on my strengths and professional goals and outline a clear plan for my post-MBA career. I also profited from the Career Services' corporate relationships, which led to me being put forward for my current role." Helena Kappen, Copenhagen MBA Class of 2014, Product Marketing Manager for Microsoft. Keen to pursue your MBA in one of the happiest and greenest cities and understand how it benefits your career advancement? Meet our Admissions Manager to find out how our MBA programme can help you excel. The invaluable skills and knowledge you will gain during your MBA will both boost your career in the short term and provide a platform for sustained business progression. Capture opportunities, discover your core strengths and connect to potential employers during the MBA Career Module. Learn more in this video! Khanya from South Africa traded consulting for an in-house position in commercial excellence. Find out why she loves her role and working in Denmark in this video. Meet alumnus Fernando in this video. He swapped his native Brazil for Denmark and has built an exciting career in innovation. From the very start of your MBA journey, you will benefit from our personalised MBA career service that includes coaching, workshops, company visits and case competitions. It is an individual journey that lets you reflect over your post-MBA goals, your personal strengths and talents, as well as your ideal job situation and past experiences. If you, like many of our graduates, are interested in staying in Denmark post-MBA, we will match you up with an alumnus who will be your personal career mentor in the third trimester and help you better understand the industry you have chosen. Looking at the last two graduating classes, half of the graduates' post-MBA roles were in Denmark. We work with you to help you identify and understand your career goals and help you to achieve your ambitions. We focus on three main areas, illustrated below: Job Search Strategy, Applications and Interviewing. 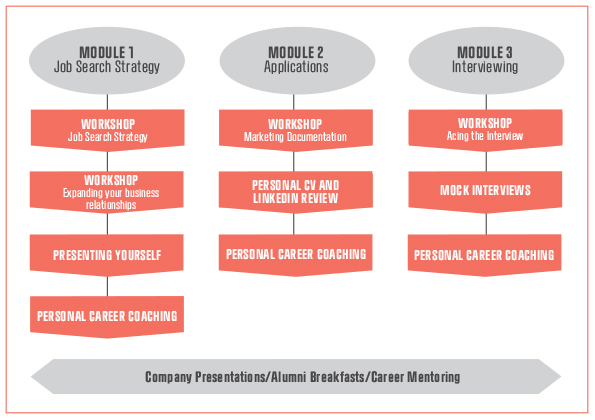 There are interactive workshops in each of these areas and you will benefit from individual coaching sessions to help you market yourself and make the most of your opportunities. Throughout the year you will experience company visits, welcome guest speakers and attend events – all of which are designed to help you make the right connections. In addition, we will introduce you to our valuable MBA Alumni network, the biggest MBA network in Scandinavia, and you will have numerous opportunities to interact with CBS MBA alumni, both on formal and less formal occasions. Learn more about the Copenhagen MBA Career Module in this video. 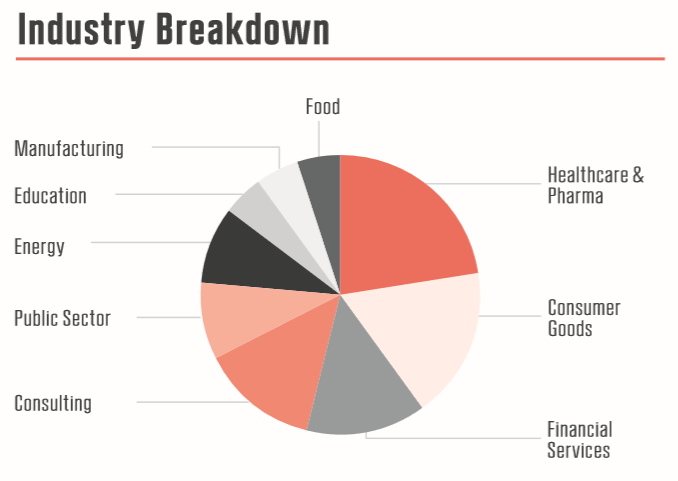 Below is an example of the industries in which Copenhagen MBA graduates found employment. If you are a recruiter/company interested in working together with Copenhagen MBAs please contact our Careers Manager on mbacareers@cbs.dk; +45 3815 6024.